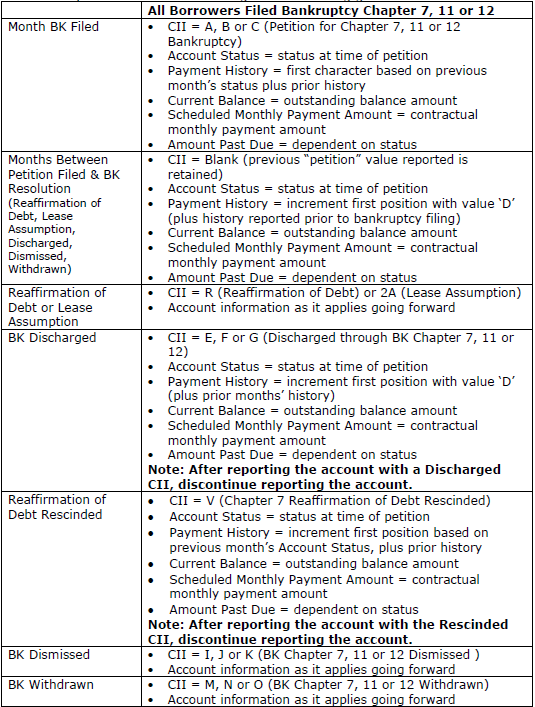 Question: Is there a preferred method of reporting when accounts are completely or partially reaffirmed in bankruptcy? Answer: For accounts that are completely reaffirmed in bankruptcy, report the appropriate Account Status (Field 17A) and the Consumer Information Indicator R, which states “Reaffirmation of Debt”. The Consumer Information Indicator (Base Segment Field 38 and J1/J2 Segment Field 11) should be reported for each consumer who was involved in the bankruptcy. For accounts that are partially reaffirmed in bankruptcy, report a separate tradeline with a new Account Number for the portion of the account that is in repayment. For this new tradeline, report the Consumer Information Indicator R for each affected consumer, which states “Reaffirmation of Debt”, plus the appropriate Account Status. 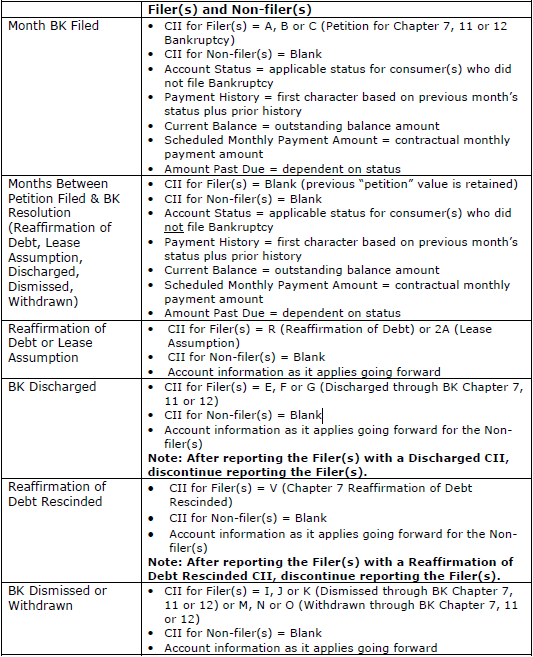 For that portion of the original tradeline which is still included in bankruptcy, report the appropriate Account Status (Field 17A), the appropriate Consumer Information Indicator (Base Segment Field 38 and J1/J2 Segment Field 11), and adjust the Current Balance (Field 21) accordingly. Question: How should an account be reported when all borrowers associated to the account filed Bankruptcy Chapter 7, 11 or 12? Question: How should a joint account be reported when one borrower filed Bankruptcy Chapter 7, 11 or 12 and the other borrower did not? Question: How should an account be reported when all borrowers associated to the account filed Bankruptcy Chapter 13? 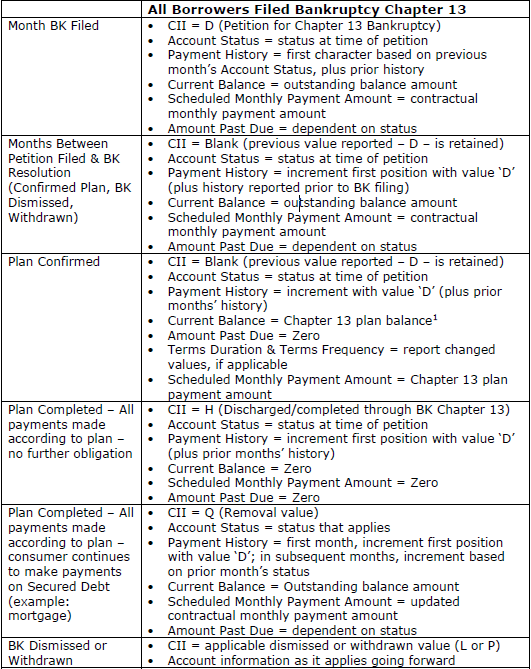 consult with internal Legal to determine what amount to report in the Current Balance field.